ConveyThisBETA is a free translator for any website and blog. 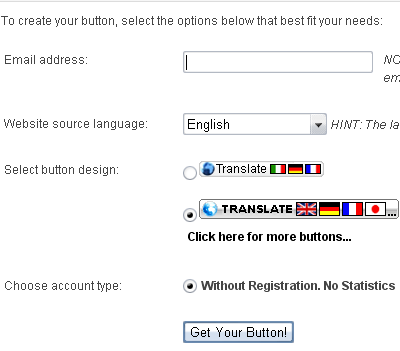 Install translation button to your website or blog and make it accessible in 40 languages. Free translation statistics will tell you how many times your web page was displayed, how many times it was translated, what languages were used the most often, and which free translators where utilized most frequently. 1.First go to their website. 2.Now enter your email address,choose Website source language(The language of your website),Select button design,Choose account type. 3.Now click get your button.You can see the code for your button.copy it. 5.Click on 'Add a Gadget' on the sidebar. Now you are done. It will look like this.